THE FLOW - Welcome to the official site of the greek psychedelic space rock band .. In the beggining . . Here Argyris is on the floor playing "Stamna"
There were many things and facts that led to the "incubation" of "the flow". During the years 1992-1994 member and oldest member of the band,Thanasis Ekonomopoulos(known as "thaneco")formed a band with Argyris Makris (the first drummer of "the flow")and several other musicians from Patras. Argyris Makris happened to be a schoolmate of Ekonomopoulos from the first elementary school. After second grade school, Argyris left and the two friends met again in 1992 during a party at a music club in Rion. There they decided to form the band that didn't managed to get an official name although Argyris suggested the name "Undercover Vamps". The band's music style was close to Gothic music which was popular at that period of time. Several songs were composed but never managed to get released. Then, in 1994, Thanasis Ekonomopoulos left the band and traveled to the United States of America to study music composition. There he completely lost contact with Argyris and his friends from the "Undercover Vamps". After 4 years of studying (in 1998), he came back to Patras, Greece with his first music diploma and thirsty for new gigs. 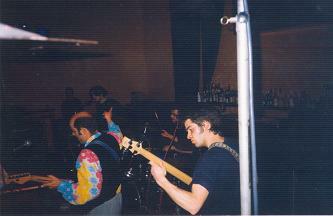 In 1998, Patras was a poor place for new bands to develop and become successful. There were very few places for concerts and cultural events. Despite the poor cultural environment, Ekonomopoulos and Makris begun playing again with a new line up and new ideas. The University of Patras offered a good studio for rehearsals and new bands and artists were emerging from that area. The majority of the bands were Heavy metal, Punk, and Greek Rock. The new band of Ekonomopoulos and Makris was developing a style of music that was far away from these styles of music. There were influences from Porcupine Tree, Pink Floyd, Ozric Tentacles, Soft Machine and other psychedelic-space rock bands from 70s,80s, and 90s. 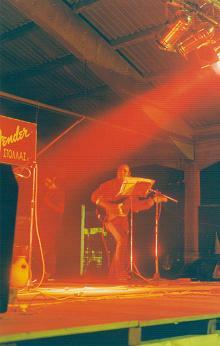 In the year 1999 and during a short gig at the university of Patras, Ekonomopoulos and Makris met Theodoros (Akis) Mbousias who played guitar. Mbousias was playing in another band which had influences from 60s psychedelia. Soon Mbousias agreed to join Ekonomopoulos and Makris in their new band. In their search for a new bass player, the band met Yiannis Stathopoulos who had experience in other bands outside Patras. Now, the new line up consisted of Makris Argyris (drums), Ekonomopoulos Thanasis (lead vocals, keyboards), Mbousias Akis (guitar), Yiannis Stathopoulos (bass). 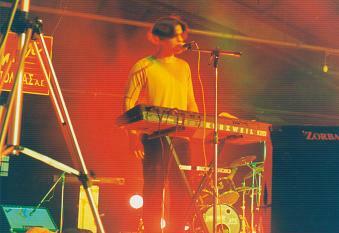 In a matter of a few months, the band developed a strange mixture of music styles that ranged from psychedelic rock to dark experimental music. 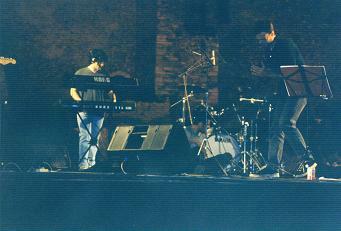 The new band played their first concert in Dock 4 (in 1999), a dock area at the harbour of Patras, that was transformed into a concert hall. The "Dock 4 festival" was a 2 day festival with great cultural success despite the bad acoustics. There were several other bands playing in that festival including the now famous pop group "Raining Pleasure" from Patras. The Flow played a wide variety of music styles begining the set with pop-style songs such as "Perfume", going into dark gothic-style songs such as "Spring Rain" (remainings from the gothic-style period of the "Undercover Vamps"), and concluding with a psychedelic improvisation called "the danse of the seven veils", with Argyris playing an ancient percussion instrument called "Stamna". Katerina Nikolakopoulou. Soon, the band began rehearsing and after a few days decided that Thanasis Nikolakopoulos should be the lead singer. 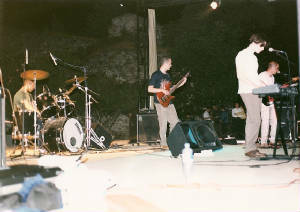 With Nikolakopoulos as a front man, the band played their first concert as a full group which took place in the old Castle of Patras. It was a music festival organised by the university of Patras. The flow gave their best perfomance that is still remembered with nostalgia. 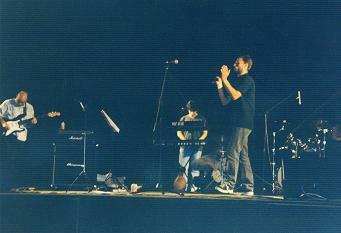 Two months after the concert, the band record their first demo (20-25 of July 2000). It was a collection of old and new material. The band's style of music was becoming more clear and more personal than before. Although the demo was recorded and mixed with just the band's equipment, the result was great. The demo was distributed among friends and finaly ended up in a local fanzine called "Scream" (#20). 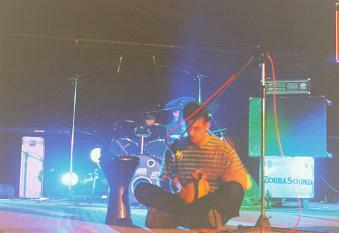 The following months, the demo caught the attention of the magazine "Jazz & Tzaz" which wrote the following critic: " ..darker and distant, the flow care for the creation of an atmosphere that reminds us the bands of krautrock (their best track is spacestation 61) and other non-German bands such as the Ozric Tentacles..". After that, there were other concerts in different parts of the city and the flow continue to develope their music. The year 2001 was the begining of trouble for the flow. The first and biggest disaster that hit the band was the departure of Argyris Makris. Makris left the band and went to Athens to become a doctor. The band was unable to find a replacement and begun spliting. After that , Stathopoulos and Nikolakopoulos went to England to finish their studies and Ekonomopoulos and Mbousias return to their everyday activities in Patras, Greece. The concept of the band remained alive and Ekonomopoulos and Mbousias begun working together as a duo, writing new matterial. Several tracks were recorded in Ekonomopoulos home-studio that were kept "safe and warm" for the band's comeback. The re-union of the band took a long time to happen.. but it did happen. It was late 2002 when the flow begun working for their first proffesional album with the title "Incubation". They found producer Fotinos Andreopoulos who had a very well equiped music studio in Patras and who agreed to produce the album. But it was a difficult task because the band was having a new drummer, Mbarounis Nikos who was still working out the songs and there was.. the army. Soon after Stathopoulos returned to Greece, joined the Greek army. Now it was very difficult for the band to go in the studio and record the album. Fortunately those difficulties were soon overcomed. Mbarounis Nikos did a good job with the drum tracks and Katerina Nikolakopoulou who previously joined the band as a second vocalist, helped a lot in the making of the album. 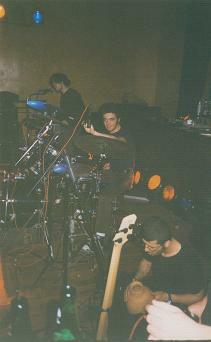 Stathopoulos managed to record his bass parts during the time he was out of the army. Mbousias, Stathopoulos and Ekonomopoulos organised the time schedule while the other where busy. The album "Incubation" was finished after several months of recording and mixing. The result was excellent although some things could have been done differently. In 2003, The Flow begun distributing the album localy, in the record shops of Patras. In 2006 the flow met Karathanasis Nikos who had an internet record shop called "Anazitisi Records" and helped the band distribute the album outside Patras. At the same time "Jazz & Tzaz" wrote a very nice music critic for the album "incubation" which appeared in the issue 162. 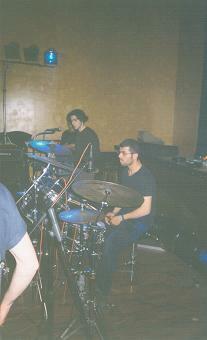 In 2010 Papandreopoulos Periklis became the new drummer of the band. The flow performed live in tripolis music festival and in Catamaran club (Panagopoula, Ahaia). They begun writing new songs for the second lp which they will mix and master at their home studio in Patras.